One of the leading Indian business tycoons, Dhirajilal Hirachand Ambani, popularly known as Dhirubhai Ambani, was the founder of Reliance Industries, which has become one of the largest business empires in India. With his vehement enthusiasm and indomitable will, he came within the top 50 businessmen of Asia published by The Sunday Times. Dhirubhai Ambani was born in a Modh family on 28 December 1932 in the village of Chorvad in district Junagadh, Gujarat. His father, Hirachand Govardhandas Ambani, was a school teacher and mother, Jamanaben was a homemaker. Dhirubhai Ambani went to the school of Junagadh where he was elected as the General Secretary of Junagadh State Union which ignited the spirit of socialism and politics. In 1949, a new Socialist party emerged from the Congress in which he was offered to be the part after the victory. But he kept his political aspect aside and focused on academics due to sheer indomitable will. But due to family constraints, he left his education and took a job in Aden. At Aden, he took up a clerical job at A. Besse & Co, where he learned different business tactics. These tactics included commodity trading, imports, and exports, wholesale merchandising, accounting, dealing with banks and insurance companies, book-keeping and preparing shipping papers and documents. In the process, he discovered that he had a natural interest towards speculative trading in all sorts of goods and made profitable deals. In 1954, he married Kokilaben and went for working in Shell Oil Refinery newly set up in Aden. Later in that decade, he came back to India and dreamt of phenomenal industrial growth in his country. Back in India, Dhirubhai had very little capital and could not make large investments. Thus, he went for spice trading under the banner of Reliance Commercial Corporations, but he was not satisfied and hence shifted his focus to yarn trading which involved high levels of risk. In January 1967, his vision came true only due to his indomitable will as he could set up his first textile mill in Naroda, Ahmadabad which produced the finest quality of Nylon. But the other mill owners opposed the fabric of Reliance and hence he directly sold the fabric to the retailers. Soon the market flourished with the ‘Vimal’ (the name of his fabric) which became the best-seller fashion fabric. The market bloomed and demands rose and so did the profits accelerated. With the increased capital, he expanded the factory and added new machinery and manpower. By 1972, Reliance became huge and unprecedented and went from revenue of Rs. 70 crores to Rs. 75,000 crores by 2002. The fiery instinct from this leading Indian business tycoon paved the path for Reliance Industries to spread its wings to other horizons like telecommunications, information technology, infrastructure services, capital markets, energy, power, retail, textiles, and logistics. By the 1980’s his sons, Mukesh Ambani and Anil Ambani joined the business. Dhirubhai Ambani was named the “Man of the 20th century”, courtesy of FICCI. He featured among the top 50 businessmen in Asia-POWER 50 by Asia week magazine for 3 terms. In the year 2011, this man was awarded the ABLF Global Asian Award at the Asian Business Leadership Forum Awards. This leading business tycoon was deservingly awarded the country’s second-highest civilian award in January 2016 – The Padma Vibhushan. Dhirubhai Ambani was the brainchild of Reliance group of industries. Starting from a mere spice dealer to leading Indian business tycoon, he revolutionized the way of functioning of the capital market and making reliance to be the biggest empire of India. It was the first company to be featured in Forbes 500 and himself being in the top 50 businessmen of Asia. 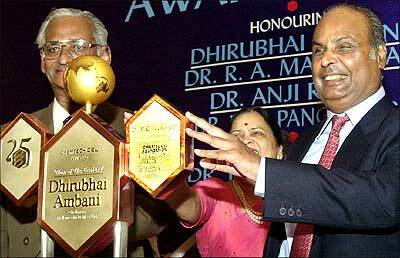 Dhirubhai Ambani died on 6 July 2002 after suffering a major stroke.